About two years ago just after I started this blog I posted the first high-resolution art of a game called ‘Adrift’. It was the French developer ‘DONTNOD Entertainment’ first game. The art was an instant hit. I guess the lure of a cyberpunk Neo-Paris was just too good to pass on. The only questions remained were what kind of gameplay the game would have and whether the developer could handle such an ambitious project. Last year we saw the first screens and video’s of ‘Remember Me’ as it was then known and of protagonist ‘Nilin’. 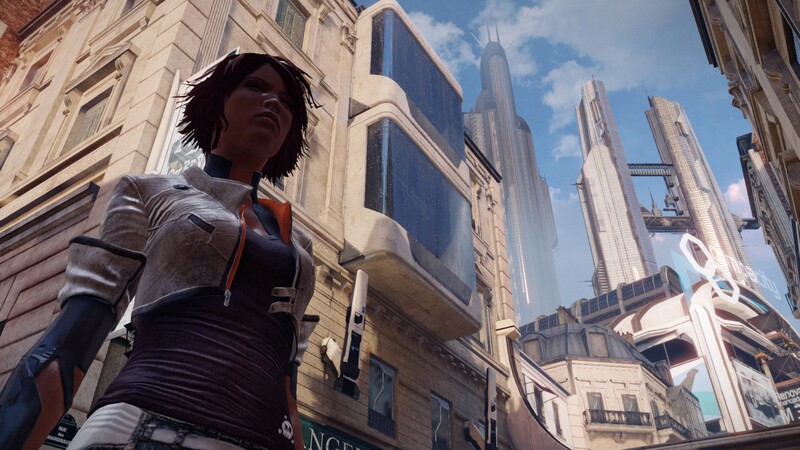 The gameplay seemed to resemble Mirror’s Edge a bit with a pinch of Deus Ex. Somewhat deceptively the videos also gave the impression of a fully interactive world. Alas the game is instead linear. I guess the scope would have just been too great for the developers otherwise. In fact this seems to be typical for many aspects of the game. There are a lot of great ideas that seemed to be have been implemented in a rush. Certain aspects such as sneaking are pointless if you can easily evade all the detection camera’s. Crawling along walls is boring if you’re following a predefined path. 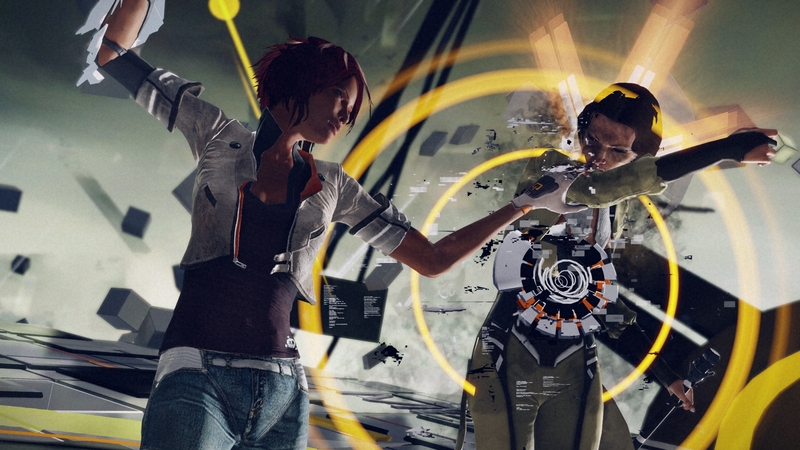 As such Remember Me fails to live up to its promise of combining the best elements of Mirror’s Edge and Deus Ex. It is by no means a bad game, what it does it does in true cyberpunk style. With games such as The Last Of Us and Resident Evil Revelations to choose from opening your wallet for Remember Me could be a difficult choice. The game begins as Nilin (Kezia Burrows), an Errorist imprisoned in the Bastille Fortress, is having almost all her memory wiped by Memorize. As she is taken to have the last of her memories wiped, a mysterious man called Edge, leader of the Errorists and a man she only hears over her coms device, helps her escape. Edge tells her that she is an Errorist with the gift of both stealing and remixing memories. 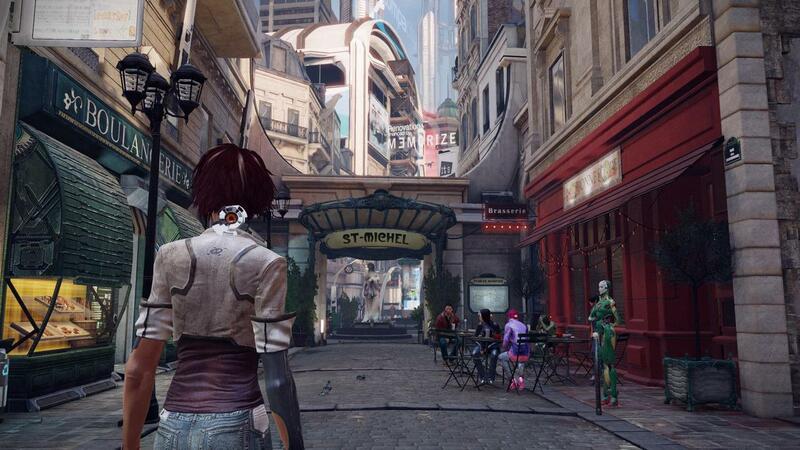 After escaping into the slums of Neo-Paris, Nilin encounters Tommy, a fellow Errorist. Suddenly, Nilin and Tommy are attacked by Olga Sedova, a bounty hunter chasing Nilin. Nilin dives into Olga’s mind and remixes her memory to make Olga become an Errorist ally and she transports Nilin to her first destination. Arriving in the Saint-Michel district, Nilin, who is aided by another Errorist codenamed Bad Request, is told by Edge to steal secret codes from Kaori Sheridan, Neo-Paris’ top architect. After retrieving and uploading the codes to Edge, he uses the codes to open the Saint-Michel dam, flooding the district. Due to the flood draining out the slums, Nilin easily infiltrates the Bastille and heads to the memory servers to free the stored memories of herself and the inmates while taking down Madame, the sadistic manager of the Bastille. After defeating Madame, Nilin releases the memories of the inmates and partially regains some of her own. She remembers the crime that landed her in the Bastille; on a mission, Nilin remixed the mind of a Memorize commander and made him believe he had killed his girlfriend. The altered memory pushed him to commit suicide. Nilin reluctantly goes along with Edge’s next plan: to remix the CEO of Memorize, Scylla Cartier-Wells, to make her see the harm her company’s technology is causing. Nilin makes her way into Scylla’s office and enters her mind, remixing the memory of a car crash which left her with a bitterness against the world. As she changes the memory to make Scylla a more compassionate person, Nilin discovers that she is Scylla’s daughter. Nilin is then told by Edge to head for the Bastille basements to save Bad Request, who has been taken captive. She finds Bad Request, but discovers that his memory has been fully wiped. Nilin then discovers that Memorize scientist Doctor Quaid is trying to find a way to control the Leapers through their Sensens to create a private army for Memorize. However, Johnny Greenteeth, a former co-worker of Quaid’s who was experimented on and turned into a Leaper, kills Quaid and prepares to self-destruct the Bastille. Bad Request helps Nilin take down Johnny at the cost of his life and Nilin escapes the destroyed facility. With all Memorize’s secret operations taken down, Edge presses Nilin to find the Conception Cube, Memorize’s central base, and destroy H3O, the Memorize Central Server. Once there, she encounters her father, Charles Cartier-Wells, the creator of the Sensen. Upon finding him, she sees that, fueled by the car accident that injured his wife, he has become lost in a dream of an ideal world free from painful memories, all inspired by the desire to help Nilin forget about the accident. Nilin makes him see the harm his technology causes, and Scylla arrives to convince Charles to help Nilin enter the Central Server. Once in the presence of the Central Server, it is revealed to Nilin that Edge is a self-aware entity created by the amalgamation of unwanted memories within H3O. Nilin, who unwittingly started Edge with the memories of her unhappy childhood, enters the Server and, at H30/Edge’s will, she destroys him and releases the memories back into the general population. As the memories are released, Nilin remembers Edge’s words about the mind being a fortress, and says that Edge died to remind people that memories should not become open to all, and that painful memories should be lived with rather than forcibly removed. She finishes that outside her now-restored mind she has a family again and a damaged world to heal. For a while I doubted I could play this game. My Xbox-360 is on the fritz and I am not going to buy a new one as the Xbox One is only 6 months away. My laptop may be an Elitebook but it is also 4 years old. After reading some forum posts I dared to buy the game and put the disc in the laptop tray. While my laptop supports even higher resolution I can play the game at 1400 * 900 with the effects set to medium. That is not half bad, though I hardly drooled like I did over the HQ gameplay videos that I saw. Remember Me is a stunning visual world that combines French futurism with an element of cartoonish surrealism. Neo-Paris is wonderfully depicted with many small touches that show the developers care a lot about the subject. As you play your way out of the sewers of Neo-Paris you will reach ever higher parts of the city. I must say that there were plenty of times I just stopped to admire the view. If I get a new laptop this summer I definitely plan to visit Neo-Paris again. The biggest flaw of Remember Me is its linear gameplay. Sure Deus Ex had some of that but it also had sandbox style freedom that allowed you to move in a city taking quests. After games such as Assassins Creed 3 I think Remember Me is perhaps two generations out of date. At times I could feel that the developers had to give up on an idea just to make the deadline. I think sandbox style freedom was one of them. The game is very story driven and aspects on memories focus heavily on continuing the story instead of allowing the player to make their own choice. This in contrast to Deus Ex Human Revolution. The fighting sequences never manages to convince me much. It was too much button bashing and no silent headshots to get past security. During the summer holiday two years ago I was playing Deus Ex and Mirror’s Edge. I had high hopes for Remember Me back then, but the game is not as good in any department as those previously mentioned. Remember Me could have improved radically with another 6 months of development. I guess that would hurt sales as the next generation consoles would also be released about the same time. 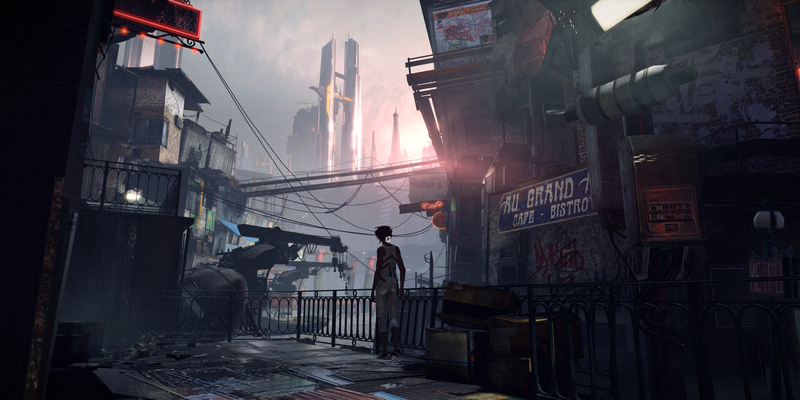 Ubisoft’s Watch Dogs would probably own Remember Me big time. If you have the money to spend and can forgive some of its creative flaws than this game is an excellent way to test your system. Strangely enough this game reminds me of Scrapland. I don’t know why! Score; 6.7 / 10. I have been somewhat forgiving of a few flaws and instead enjoyed the old-school story aspects. Next story Continuum gets renewed for third season! Previous story Defiance episode 7 ‘Goodbye, Blue Sky’ Review!